“Bonnie Prince Charlie”, known as Bonnie for short, is a sensitive bear. If any bear needs a boost in self-confidence as a bear, it’s Bonnie. Having spent the first part of his life confined to a small cage, he became very shy. 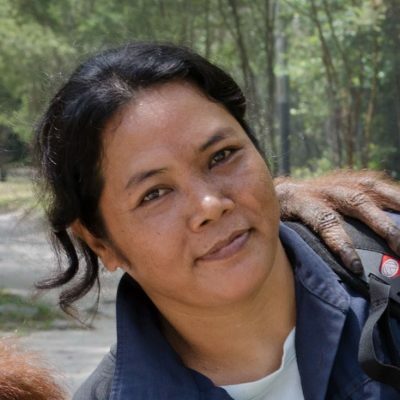 During his early days at the Orangutan Care Centre & Quarantine (OCCQ) in Central Indonesian Borneo (Kalimantan), he hesitated more often than not to venture out, due to a possible fear of what may lay outside the safety of his enclosure. Like too many other sun bears, Bonnie was kept taken from his mother and kept as a pet when he was just a cub. Despite the fact that it is illegal to keep these endangered species as pets or kill them, sun bear mothers are frequently poached for their gall bladders which are used in Chinese medicine. Their young are taken because of their perceived “cuteness” and sold as pets. However, as these sun bears mature they become less attractive to their “owners” who may then kill or sell them for their organs, and occasionally, call the forestry department to have their overgrown pets taken away. By then, the captive bears are far too habituated to humans to be safely released to the wild. The bear enclosures at the OCCQ are quite different from the orangutan enclosures. The majority of the incoming bears will be permanent residents and therefore, the enclosures are built in order to accommodate the bears for the long term. 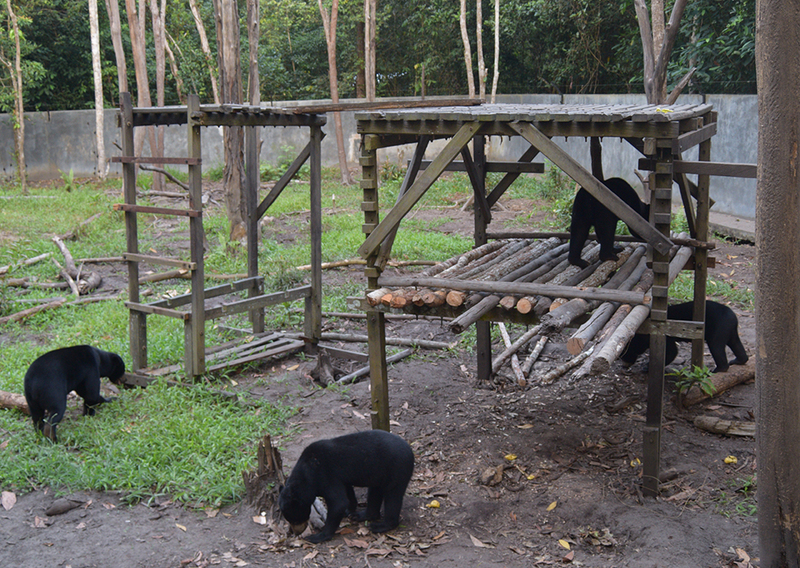 When Bonnie first arrived he was housed with sun bears Desi and Hilda. At the time, the one-hectare (2.5 acres) forest sanctuary enclosure housing them had just been built. Given his initial hesitancy to explore, it took great effort for him to even to cross a wooden bridge over a culvert. Bonnie at first would pace back and forth, seemingly wanting to cross. When he was finally able work up the courage, he crossed the bridge and the whole forest enclosure was accessible to him. 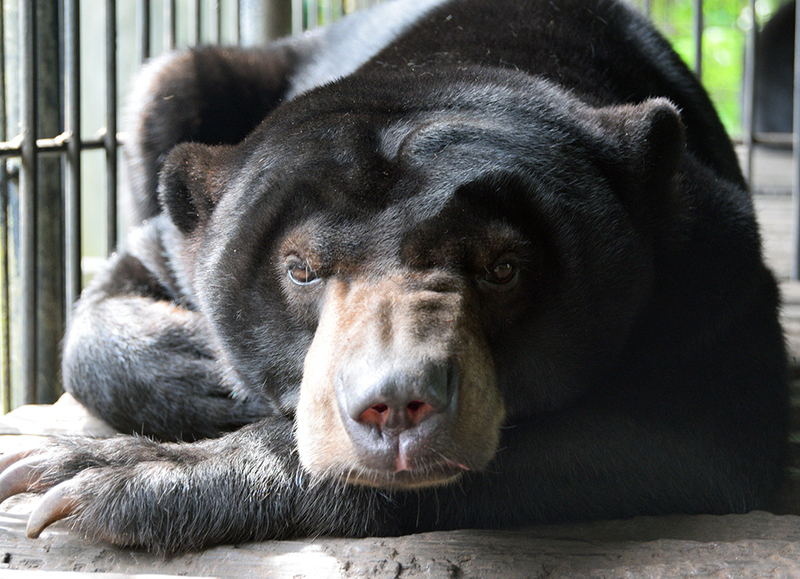 Being a permanent resident at the OCCQ Bonnie underwent a vasectomy procedure, which allowed him to be housed with both male or female sun bears. However, even after the vasectomy, Bonnie showed frequent interest in female bears, chasing them and initiating play. Given this behavior, there became issues with aggression and all three bears were stressed, especially Bonnie. Ultimately it was determined it would be better to house him with other bears. 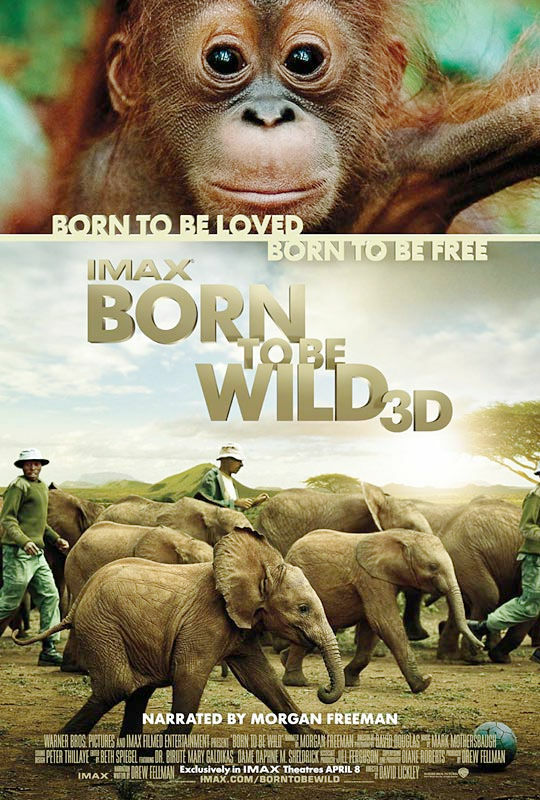 He was introduced into an enclosure housing two males, Ori and Komet. The three got along instantly. Later when another younger male named Chico was introduced to the enclosure, Bonnie finally had a playmate of his own, and the two instantly struck up a rapport. 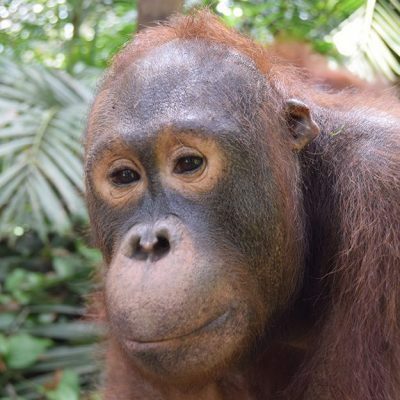 The pecking order in the “all boys” enclosure has generally seen Ori at the top, Komet content as number two, and Chico being the newest and youngest, at the bottom. However, Bonnie is definitely a pretender for the throne. Bonnie has begun to regain his confidence of late and this has been attributed in part to “training” sessions. Bonnie has turned out to be very responsive to these sessions. Training is something that can be highly beneficial for an animal needing lifelong care. It opens up communication and creates arelationship between human caregivers and the bears. Not only can training give a traumatized bear his/her confidence back, he/she can learn to trust the caregiver, better facilitating health checks and providing a good form of exercise. Training techniques vary from teaching bears with a reward to put their nose to an object or to present their claws and allow caregivers to examine them. None of these behaviors are for show or for amusement, but purely for the good of the animal. The bears at the OCCQ often get very excited when they know it’s time for training, none more so then Bonnie. He becomes very excited and can have little run-ins with his peers pushing them out of the way. Thankfully the training is also good at diffusing tensions between bears. Saying “buka,” which means “open” in Indonesian, along with an appropriate hand gesture, allowed Bonnie, after training, to know what was being asked of him. So now after he hears “Buka” he opens his mouth wide, ready for a reward. Rewards vary from high value food like honey to nutritious treats like dog food. With these training techniques, trust is established. With trust, more of a bear’s personality comes through and better health checks can be made. It is a win-win situation. The bears routinely get enrichment. Bonnie particularly enjoys ice on really hot days. Frozen coconut water is given out to the bears and while the others may just eat or slurp it, Bonnie has other uses for it. He grabs it in his paw and rubs it on top of his head – another way of cooling off! In preparing this article we realized just how difficult it was to get a good photograph of Bonnie since he now moves so swiftly around the communal enclosure. After an initial bumpy start, with constant care, attention and training, Bonnie has been able to fully settle into the OCCQ and is able to live a full and active life with his bear peers and human caregivers. He exemplifies mutual respect and understanding between humans and bears. In Bonnie’s case, it is true that if you open up to the animals, they will open up to you and you will get to know each other better. Adrienne made a beautiful presentation about her volunteer work with the sun bears of OFI to a group of volunteers at the Honolulu Zoo. 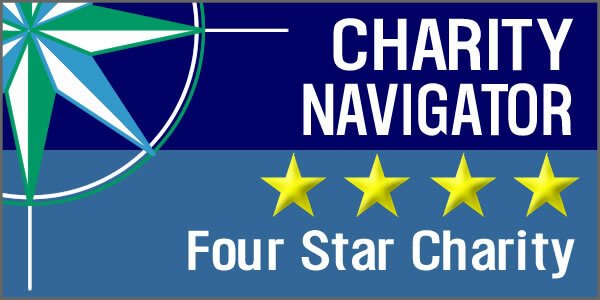 We have a deeper understanding of the important work that you do. Thank you for your many labors of love. I couldn’t agree more, Adrienne’s presentation was enlightening and opened my eyes too. It is an honor to meet such a dedicated and smart animal care giver/trainer.